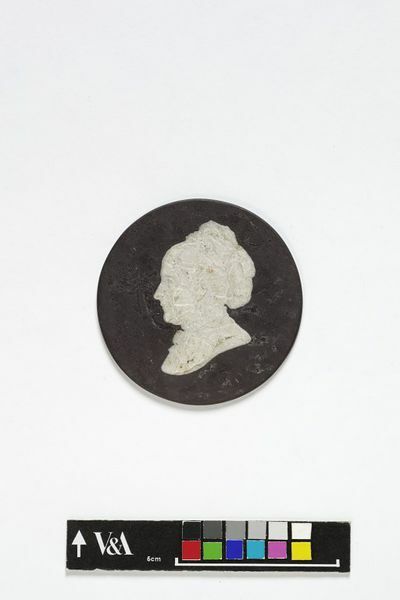 This is a model for a commemorative medal, as yet untraced, made by George Gammon Adams. George Gammon Adams (b. 1821-1898) was a portrait sculptor and medallist. He designed and exhibited prize medals for the Great Exhibition. In 1852 he was chosen to model the death mask of Wellington. One of his public monuments is the 'Napier' statue in Trafalgar square. 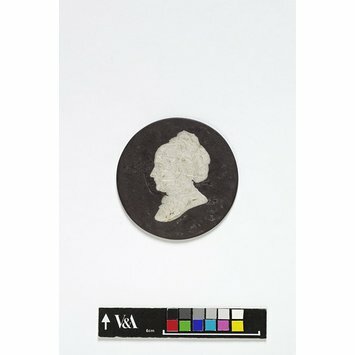 The roundel was among the items given to the Museum by I. D. Adams, the daughter of George Gammon Adams, in 1980. In total, 196 items were included in the Adams gift, which consisted of many models for medals as well as the busts and figurative sculpture. In most instances it is not possible to date conclusively the many models included in this gift. Head to left in profile of middle-aged lady. Her hair is drawn towards the back of her head with hair decoration. Given by Miss I.D. Adams, daughter of George Gammon Adams in 1980.